Espoo internal route 11 will be diverted in the direction of Tapiolan on Tuesday 28 June and Wednesday 29 June from 7.30pm until the end of service to run along Hauenkalliontie, Haukilahdenkatu and Merituulentie. The bus will not serve Gräsanlaakso. The following bus stops will not be served: Matinsyrjä (E3131) , Niittykummunsilta (E3236) and Niittykumpu (M) (E2131). In the direction of Matinkylä the bus will run as usual. 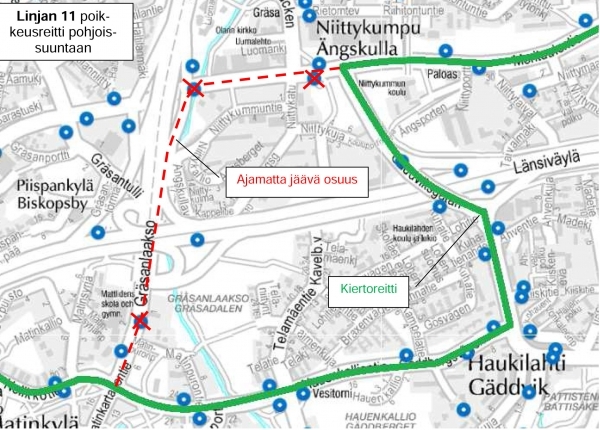 The diversion is due to pavement work at the Gräsanlaakso intersection.